“If we can combine all three we can improve detection probability and reduce false alarms. That’s our aim,” says Abeynayake. The major challenges in IED detection using GPR are caused by the localised variation in terrain and climate, and the variety of IEDs encountered. Predicting GPR performance in diverse operational scenarios requires understanding the capabilities of GPR in relation to the physical properties of soils. 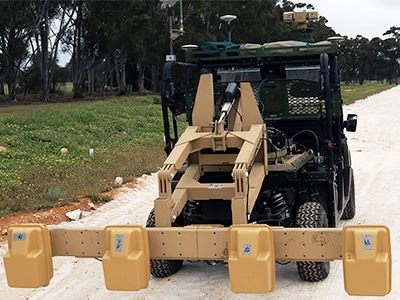 Over six weeks the teams drove the US Polaris and ADF Husky GPR vehicles up and down lanes of Australian soil at sites across Australia that had been seeded with objects representing IEDs. The accumulated raw data will be used to assess improvements to the processing algorithms. 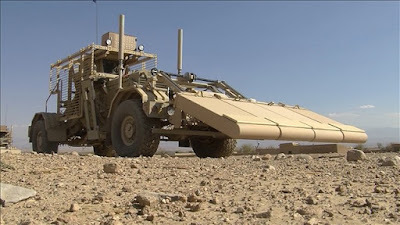 Abeynayake says the Defence Science and Technology (DST) team will be investigating the algorithms at the lowest level to see which components are underperforming in different soils and against different targets. The quality of the signal processing algorithms plays a very important role in the ultimate effectiveness of a GPR system by transforming signals into meaningful information for the operators. Yet Abeynayake says some current approaches to target identification in GPR lack a solid theoretical basis in the underlying physics, which is fundamental to understanding the responses from GPR. “Only when target and clutter characteristics are both well understood can signal processing be applied effectively,” Abeynayake explains.